The noble, even heroic, challenge of cutting ties to the modern world and pitting oneself against Mother Nature evokes a primal longing and envy deep in the hearts of many. These would-be frontier men rage against the rat race… sometimes running from civilization altogether, seeking far-flung wilderness, believing only there can they realize their dream of independence. And many seem drawn to the wilderness of the frigid north for their self-sufficient life. They try to bend nature to their purposes, battling the terrain. As if to achieve self-sufficiency we must struggle and toil like our forefathers did. These efforts to recapture a lost sense of self, self-reliance, and purpose are the driving force behind the popularity of a seemingly endless series of “self-sufficiency” TV shows. For everyone who strives for this Walden-esque lifestyle, a hundred more give up on it, thinking they won’t be able to hack such a tough, unforgiving life. Why does Belize offer better conditions than other countries you might look to for self-sufficiency? Belize has a near perfect climate for growing, with average year-round temperatures of about 80°F and rarely ever breaking 100. There has not been snowfall in Belize in living memory. Belize receives an average of 120 inches of rain per year. Water is one of the most crucial elements to a self-sufficient lifestyle, and Belize gets plenty of this precious resource. Plus, it doesn’t come from a shrinking aquifer or corroded pipe, it falls from the sky, and with the many rivers and creeks that transect Belize, there is ample potential for hydropower. With a little planning and design, you’ll never run short of water for your home or farm. Belize has up to three growing seasons per year; with the correct knowledge, food grows all year long. Belize’s sunny climate is nearly ideal for solar power generation, allowing much better solar capture than most other locations on Earth. Whenever I talk to anyone about self-sufficiency, their first question is: What’s the easiest way to do it? There are many answers… but the truest one is simply to go where being self-sufficient is easiest. Then it’s not a destination for self-sufficiency. Here in Belize, self-sufficiency practically grows on trees… In fact, I can literally produce nearly everything I need for the future by planting the correct combination of trees today. Generate sustainable incomes selling these products and others. And this stuff isn’t theoretical; many communities in Belize model various forms of self-sufficiency today. Traditional Mennonite communities choose to live isolated lives, growing and producing most everything they use. They live without power and often without running water. Personally, I’m happy that I don’t have to resort to this level of self-sufficiency… As I pass them on the road with their horses and buggies, I often wonder if I could happily live in a state of self-reliance so fundamental. 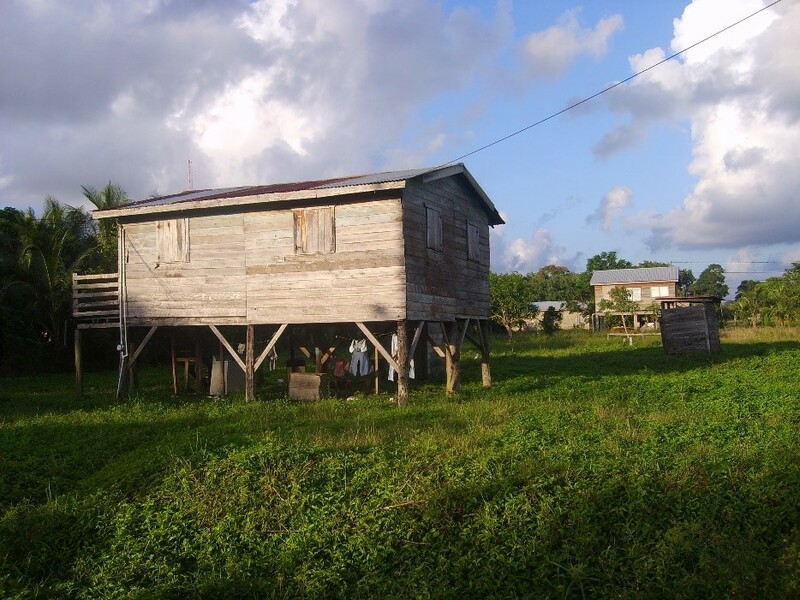 The rural villages around Belize, especially those predominately of Maya, Hispanic, or mestizo heritage, haven’t been long connected to the grid. Many still live in traditional-style huts like their ancestors did, with only a cable television wire attached to a stick sprouting from the thatch to betray that they belong to this millennium. Though the villagers enjoy electricity, cable TV, and running water, it was only 20 years ago that electricity was nearly nonexistent and that homes had a rainwater barrel or water was carried from the river. As recently as the 90s, most relied on hunting and backyard food production for sustenance. With the advent of Hurricane Earl (which passed through Belize in early August 2016, causing little wind damage but knocking out the power grid for hours up to days in some parts due to flooding), it was the villagers who best adapted. They simply reverted to their old ways until they got plugged back in, knowing exactly how to continue everyday life without power, water, or access to grocery stores. Proverb: Raktone da riba batam neba know sun hat. Translation: Rock stone at river bottom never knows the sun is hot. Meaning: Someone who is secluded often doesn’t know of life worries. Granny sent the kids out to collect avocados, mangos, and breadfruit. Men went off hunting (and to enjoy their homemade fruit wine by the river after the hunt). Children gathered berries and might have been lucky enough to bag an iguana or two for dinner (called “bamboo chicken”… you don’t need to wait for a natural disaster to enjoy this delicacy). Belizeans can quickly adjust to living a less connected life, and we all can too. The self-sufficient life can be achieved in any country in the world; wherever you are, you can take steps to become more resilient and in control of your destiny. But Belize makes it easy. The country celebrates freedom and self-reliance, and she provides great beauty and bounty. So come to Belize, experience the thrill of wresting control of your destiny back from the system, and enjoy the empowerment of a self-sufficient life.